Franklin has received plenty of honors over her decades-spanning career — so much so that the chalice of accolades runneth over. She was the first woman inducted into the Rock & Roll Hall of Fame, in 1987. She received the Presidential Medal of Freedom, the nation's highest civilian honor, in 2005. And Franklin sang "My Country, 'Tis Of Thee" at President Barack Obama's first inauguration. The Queen of Soul rarely gave interviews, so we were delighted when she sat down for a Fresh Air interview in 1999. 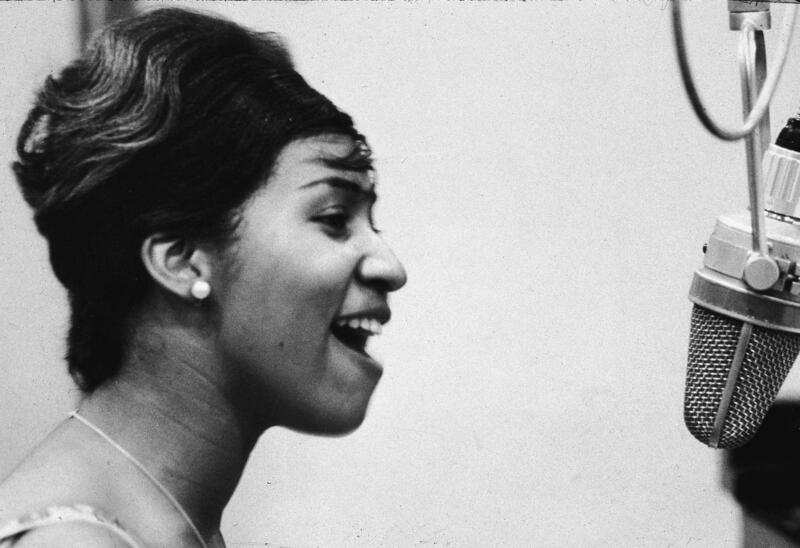 Franklin spoke about her father's gospel influence, growing up with Sam Cooke, crossing over to pop music and more. Read Franklin's edited conversation with NPR's Terry Gross below and listen via the audio link. Terry Gross: Let's talk a little bit about the influences on you during your formative years. First of all, let's talk a little bit about your father, the Rev. C.L. Franklin. He was one of the most popular preachers of his generation. He was nationally known through his tours and through radio broadcasts as well as recordings. You say in [Aretha: From These Roots] that church nurses carried smelling salts to revive worshippers who were overcome to the point of fainting by the spirit or by your father's sermons. What was it like for you to watch your father speak and people fainting in turn? Aretha Franklin: Well, it was tremendous. I loved going to church. I enjoyed being a part of the choir and just doing things in and around the church. But as a young girl, I certainly enjoyed watching and listening to my dad. You toured with your father through churches through the Deep South. And I'm wondering what it was like for you during the days of segregation to tour through the Deep South [and] how that compared to what you were used to in Detroit. Well, it certainly was not what I was used to or accustomed to in Detroit. There were times that we were asked to go to the back of the restaurant, say, or we couldn't use the bathrooms. We got information that, Gulf [gas stations], you could use the bathrooms there — and we didn't buy gas where we could not use the restrooms. So we went to Gulf a lot, I must tell you. You say about your father he was a minister. He was also a man, and that some women pursued him aggressively night and day. So he wasn't uncomfortable with that? I have no idea. I never discussed it with him, and he never discussed that sort of thing with his children. But as children, we could certainly see that women were kind of aggressively taking off behind him. He was single at the time, and sometimes you might see it with ladies sitting on the front row, a little high, skirts a little high, a little short, you know, when women are interested. Many singers who grew up in the church weren't allowed by their parents to listen to or to perform pop music. It wasn't that way in your family. Great performers like Nat Cole and Art Tatum knew your father and would sometimes be in your living room at the piano. That must've been something. Yes, that's true. Art Tatum was often a visitor in our home. He was a very good friend of my dad's. [Also] Oscar Peterson, Arthur Prysock, Mahalia Jackson, and he loved Sam Cooke. And he just really very broadly appreciated one's artistry when they were truly gifted and really good. Now, you were friends with Sam Cooke, the great gospel singer turned soul singer. How did you meet? Sam and I met at a Sunday evening program that we had at our church back in the early '50s. And I was sitting there waiting for the program to start after church, and I just happened to look back over my shoulder and I saw this group of people coming down the aisle. And, oh, my God, the man that was leading them — Sam and his brother LC. These guys were really super sharp. They had on beautiful navy blue and brown trench coats. And I had never seen anyone quite as attractive — not a male as attractive as Sam was. And so [laughs] prior to the program my soul was kind of being stirred in another way. Well, now, he crossed over from gospel to pop before you did. What impact did it have on you when you heard him having a hit pop song on the radio? Well, we were going down the highway, somewhere in the South and — my sister and I and the driver and maybe one or two other people in the car. We knew that he had left the gospel field and of course I was rather sad about that. But as we were driving, we knew that he had recorded, and just out of the dark came this fabulous voice and it was Sam. And it was his first record, and he was singing "You Send Me." And there was just pandemonium in the car. My sister and I just had a fit. ' "You Send Me' It's his record!" You know? And there was just so much excitement in the car, the driver had to pull over. You were living in Detroit. so when you decided to make pop records, I mean, the obvious choice, I suppose, would've been Motown, especially since Berry Gordy was a friend of the family. I guess Motown was a very new label at the time. But did you consider Motown? Actually, no, I really did not. My dad and I had talked about it, and we really kind of had our sights set on Columbia Records out of New York. We knew that Columbia was a worldwide label, and I think the feeling probably was that the promotion would be better than, say, a Motown, or the distribution and the promotion and so on. And so we just kind of maintained that feeling that Columbia and other major record labels were the people that we wanted to talk to. Now, you were playing a lot of clubs during those early years, and a lot of those clubs were jazz clubs. And the people who you shared a bill with included John Coltrane and Charles Mingus. Was this a new kind of music for you? Not exactly a new kind of music. As a very small girl, I listened to Charlie Parker and loved him. And Max Roach and people like that. I had not been in the jazz environment having been brought up in the church. But once I got to New York ... I was signed to perform at The Village Gate and The Vanguard and clubs like that and these. The Vanguard was one of the most elite, if not the most elite, jazz club out there. What was different about the jazz environment? What were some of the things you hadn't been exposed to before? Sitting in the audience then, this was at The Village Gate. And he kept right on playing. You know, nobody missed a beat. In 1966, after your contract with Columbia Records was up, you moved to Atlantic Records, which was the home of rhythm and blues greats like Ruth Brown and Ray Charles. The producer Jerry Wexler took you down to a studio in Muscle Shoals, Ala., that was famous for its great session men, which included Dan Penn and Spooner Oldham. And the first song that you recorded there was "I Never Loved A Man (The Way I Love You)." Now, Spooner Oldham tells a story that when he heard you sit down at the piano and play your first chord, he thought, 'Wow, that's really great' And that he — and he's a pianist — that he should let you play piano while he moved over to electric piano playing behind you. What did you think of that arrangement? Were you pleased that he agreed that you should be the one at the piano? I remember that particular session. It was the very first session so naturally, yes, I remember it. And we really were kind of struggling at that point to get to the music. It just wasn't quite coming off although we had dynamite players. We had the Muscle Shoals Section and they were really very, very hot, cutting them out of good, greasy stuff, or what you would call greasy in that day. But we weren't getting to the music in the way that we should have. It just wasn't coming off. And finally someone said, "Aretha, why don't you sit down and play?" And I did, and it just happened. It all just happened. We arrived, and we arrived very quickly. Peter Guralnick, the music critic, describes this recording, "I Never Loved A Man," as one of the most momentous takes in the history of rhythm and blues, in fact, in the history of American vernacular music. Now, your second single was "Respect" which is, I believe, your still most requested song. How did you end up singing this Otis Redding song? Well, I heard Mr. Redding's version of it. I just loved it. And I decided that I wanted to record it. And my sister Carolyn and I got together. I was living in a small apartment on the West Side of Detroit. Piano by the window, watching the cars go by, and we came up with that infamous line, the "Sock it to me!" line. It was a cliché of the day. Actually, we didn't just come up with it, it really was cliché. And some of the girls were saying that to the fellows, like, "Sock it to me in this way or sock it to me in that way." Nothing sexual, and it's not sexual. It was nonsexual, just a cliché line. What did this song mean to you when you sang it? I mean, really part of the backdrop of this song [was] it was a hit during the civil rights movement, and I think, you know, respect had a lot of meanings in the song for your listeners. One was, you know, just the respect you wanted from a man in a relationship. But it also had, I think, a larger resonance with the civil rights movement, you know, a kind of larger social, cultural sense of respect. Yes. In later times, it was picked up as a battle cry by the civil rights movement. But when I recorded it, it was pretty much a male-female kind of thing. And more in a general sense, from person to person, "I'm going to give you respect and I'd like to have that respect back or I expect respect to be given back." This is FRESH AIR. I'm Terry Gross. Today we remember Aretha Franklin, who died earlier today at the age of 76. We're going to listen back to the interview I recorded with her in 1999. ARETHA FRANKLIN: (Singing) Baby, baby, sweet baby, there's something that I just got to say. Baby, baby, sweet baby, you left me hurting in a real cold way. Speak your name, and I'll feel a thrill. You said, I do. And I said, I will. I told you to just be true and give me just a little time. Wait on me, baby. I want you to be all mine. I've just been so blue since you've been gone, baby, since you've been gone. GROSS: The queen of soul got her start in the Baptist church. Her father, Reverend C. L. Franklin, was a famous preacher. Aretha went on to receive many awards. She was the first woman inducted into the Rock & Roll Hall of Fame. She won 18 Grammys and was nominated 44 times. She received a National Medal of the Arts in 1999 and the Presidential Medal of Freedom in 2005. She sang at President Obama's first inauguration. We spoke after the publication of her autobiography "Aretha: From These Roots." She seldom gave interviews, so we were thrilled to have her on our show. GROSS: Before you sang soul music, you sang gospel in the church. I imagine gospel was more than just music to you. Can you talk a little bit about, you know, feeling the spirit when you sang? A. FRANKLIN: Certainly, gospel was my background - is my background. My upbringing was in the church. We had to attend regularly. And, of course, the church provided a training ground for me, so to speak, as a young vocalist and certainly, gave me all of the spiritual values that I needed as a young lady. GROSS: I'd like to play a recording that was made of you at the age of 14 singing in the church in which your father was pastor, the New Bethel Church in Detroit. A. FRANKLIN: Yes, New Bethel Baptist Church. GROSS: And this is a recording of Precious Lord. The version we're going to hear was made in 1956. This is the young 14-year-old Aretha Franklin. A. FRANKLIN: (Singing) When my, when my way grows drear, precious Lord, please linger near. And oh, when my, when my light is almost, almost gone, Father, Father, Father hear my cry Lord. And oh, hear my call. And hold, hold my, hold my hand, please Jesus, lest I fall. Oh, take my hand, precious Lord, and lead me home. GROSS: That's the young Aretha Franklin. Let's talk a little bit about the influences on you during your formative years. First of all, let's talk a little bit about your father, the Reverend C. L. Franklin. He was one of the most popular preachers of his generation. He was nationally known through his tours and through, I think, radio broadcasts, as well as recordings. You say in the book that church nurses carried smelling salts to revive worshippers who were overcome to the point of fainting by the spirit or by your father's sermons. What was it like for you to watch your father speak and people fainting in church? A. FRANKLIN: Well, it was tremendous. I loved going to church. I enjoyed being part of the choir and just doing things in and around the church. But as a young girl, I certainly enjoyed watching and listening to my dad. GROSS: You toured with your father through churches, through the Deep South. And I'm wondering what it was like for you during the days of segregation to tour through the Deep South, you know, how that compared to what you were used to in Detroit. A. FRANKLIN: Well, it certainly was not what I was used to or accustomed to in Detroit. But on the other hand, it was not that bad. We didn't have extreme experiences of any kind, but there were times that we were asked to go to the back of the restaurant, say, or we couldn't use the bathrooms. And we got information that Gulf, you could use the bathrooms there if you - and we didn't buy gas where we could not use the restrooms, so we went to Gulf a lot, I must tell you. GROSS: You say about your father, he was a minister, he was also a man and that some women pursued him aggressively night and day. GROSS: So he wasn't uncomfortable with that. A. FRANKLIN: I have no idea. I never discussed it with him, and he never discussed that sort of thing with his children. But as children, we could certainly see that women were kind of aggressively taking off behind him. He was single at the time. And sometimes, you might see it with ladies sitting on the front row, a little high - skirts a little high, little short, things like that or in other ways that we're all familiar with, you know, when women are interested. GROSS: I thought I'd play an excerpt from what is perhaps his most famous recorded sermon, "The Eagle Stirreth." Since we'll only be hearing an excerpt just to get a sense of his style of preaching, can you tell us a little bit about what the sermon was actually about? A. FRANKLIN: Having to do, as I equate it, to life, to children, to the parental function in the raising of one's children. And in certain other ways, there are parallels to your personal life. GROSS: My guest is Aretha Franklin. Let's hear an excerpt of a sermon preached by her father, Reverend C. L. Franklin. C L FRANKLIN: Most of us forget it. UNIDENTIFIED PERSON #1: That's right. C. FRANKLIN: It is said that is a man who had a poultry farm. C. FRANKLIN: And that he raised chickens for the market. C. FRANKLIN: ...That was very much unlike the other chickens on the yard. C. FRANKLIN: He outgrew the other little chicken. C. FRANKLIN: And then one day a man who knew eagles when he saw it came along and saw that little eagle walking in the yard. C. FRANKLIN: And he said to his friend, you know that you have an eagle here? C. FRANKLIN: What you ought to do is build a cage. C. FRANKLIN: Wrap the wire with. When he's a little older, he's going to get tired of the ground. C. FRANKLIN: Yes, he will. He's going to rise up, open his wings. C. FRANKLIN: Lord, he did. C. FRANKLIN: ...Is king. (Unintelligible). C. FRANKLIN: And let me tell you, the man who made the (unintelligible) open to God and let my soul fall out, yeah. You ought to came to see. Take the wings of my soul - yeah, yeah, yeah, yeah, yeah. C. FRANKLIN: Let it in. Let it on in. Let it on in. I fly away (unintelligible) - yeah, yeah, yeah, yeah, yeah, yeah. C. FRANKLIN: Let it on in. Let it on in. GROSS: That's Aretha Franklin's late father, Reverend C.L. Franklin. Many singers who grew up in the church weren't allowed by their parents to listen to or to perform pop music. It wasn't that way in your family. What did your father think about pop music and jazz? A. FRANKLIN: My dad I think appreciated gifted artists. We just didn't have that problem in our home. Rocking With Leroy used to come on when I would come in from school. It was a very, very big R&B broadcast of the day when I was a young girl. And I would come in and put my books down, lie down on the floor and listen to Rocking With Leroy. My dad really appreciated music. He appreciated gifted artists, as I said, and he never tried to limit us in any way with respect to music or anything like that. GROSS: Well, as you describe in your new autobiography, great performers like Nat Cole and Art Tatum knew your father and would sometimes be in your living room at the piano. That must have been something. A. FRANKLIN: Yes, that's true. Art Tatum was often a visitor in our home. He was a very good friend of my dad's - Oscar Peterson and Arthur Prysock, Mahalia Jackson, of course James. And he loved Sam - Sam Cooke. And he just really very broadly appreciated one's artistry when they were truly gifted and really good. GROSS: We'll hear more of my 1999 interview with Aretha Franklin after a break. This is FRESH AIR. A. FRANKLIN: (Singing) Yield not to temptation, for yielding is a sin. GROSS: This is FRESH AIR. We're paying tribute to Aretha Franklin. She died earlier today. She had been friends with the soul and gospel singer Sam Cooke. Before we hear what she had to say about their friendship, let's hear her 1968 recording of Sam Cooke's hit song "You Send Me." A. FRANKLIN: (Singing) Darling, you send me. Darling, you send me. Darling, you send me. Honest, you do. Honest, you do. Honest, you do. Oh, you thrill me. Darling, you thrill me. Baby, you thrill me. Honest, you do. Honest, you do. Honest, you do. At first - thought it was infatuation. Oh, it's lasted so long. Now I find myself wanting - I want you to marry me. Please take me home, yeah, yeah, yeah, yeah, yeah, yeah. You send me. Darling, you send me. Darling, you send me. Honest, you do. Honest, you did. You know you did. You know you do now. You send me. GROSS: Now, you were friends with Sam Cooke, the great gospel singer-turned-soul singer. How did you meet? A. FRANKLIN: Sam and I met at a Sunday evening program that we had at our church back in the early '50s. And I was sitting there waiting for the program to start after church. And I just happened to look back over my shoulder, and I saw this group of people coming down the aisle. And, oh, my God, the man that was leading them - Sam and his brother L.C. And these guys were really super sharp. They had on beautiful blue and - navy blue and brown trench coats. And I had never seen anyone quite as attractive - not a male as attractive - as Sam was. And so prior to the program, my soul was kind of being stirred in another way. GROSS: (Laughter) Now, he crossed over from gospel to pop before you did. What impact did it have on you when you heard him having a hit pop song on the radio? A. FRANKLIN: What impact did it have on me when Sam crossed over? A. FRANKLIN: We were going down the highway. We were somewhere in the South. And my sister and I and the driver and maybe one or two other people in the car - we knew that he had left the gospel field. And of course I was rather sad about that. But as we were driving, we knew that he had recorded, and just out of the dark came this fabulous voice. And it was Sam, and it was his first record. And he was singing "You Send Me." And there was just pandemonium in the car. My sister and I just had a fit. We really had to pull over and stop the car and settle down. Oh, my God, it's Sam. It's Sam. It's his record. You know, it was like that. "You Send Me" - this is - it's his record, you know? And there was just so much excitement in the car. The driver really had to pull over. GROSS: So did that make you think, maybe I should consider making pop records? A. FRANKLIN: Well, I don't know at the time. I don't think that was my feeling, and it wasn't to begin with. But as time went on and I just began to listen to more and more of his recordings and I love them - the way they were produced, the melodies, the background singers - as time went on, I began to think about the broader view. I was interested in changing fields as well, but I was not as confident I guess as Sam was to begin with. And finally I said, well, if Sam made it, maybe I could, too. And I was willing to give it a try. GROSS: Well, you were living in Detroit, so when you decided to make pop records, I mean, the obvious choice, I suppose, would have been Motown, especially since Berry Gordy was a friend of the family. I guess Motown was a very new label at the time, but did you consider Motown? A. FRANKLIN: Actually, no, I really did not. My dad and I had talked about it, and we really kind of had our sights set on Columbia Records out of New York. We knew that Columbia was a worldwide label. And I think the feeling probably was that the promotion would be better than, say, a Motown - or the distribution and the promotion and so on. And so we just kind of maintained that feeling that Columbia and other major record labels were the people that we wanted to talk to. GROSS: Well, you were signed at Columbia by John Hammond, who had earlier signed Count Basie and later signed Bob Dylan and Bruce Springsteen. Well, I want to play the first track that you recorded with John Hammond, and it's "Today I Sing The Blues." A. FRANKLIN: (Singing) Without a word of warning, the blues walked in this morning and circled round my lonely room. I didn't know why I had that sad and lonely feeling until my baby called and said, we're through. Oh, yesterday this time, I sang a love song. GROSS: We're listening to the 1999 interview I recorded with Aretha Franklin. She died earlier today. She was 76. After we take a short break, we'll talk about her years at Atlantic Records, where she recorded her hits. I'm Terry Gross, and this is FRESH AIR. A. FRANKLIN: (Singing) It strikes me kind of funny how love can be this way. We were lovers last night, honey, but I'm alone again today. And it strikes me kind of funny how fate can be unfair. I come out on the losing end in every, every love affair. Yes, it must be written for me that I should be the one, be the one to always lose. For yesterday, yesterday this time, I sang a love song, oh, oh, but right now, I'm singing the blues, oh, yeah. A. FRANKLIN: (Singing) We got our love and some R-E-S-P-E-C-T, oh. Like sweet morning dew, took one look at you, and it was plain to see that you were my destiny. With my arms open wide, I threw away my pride. I sacrificed for you, dedicated my life to you. And I will go where you lead. I'll be right there in a time of need. And when I lose my will, you'll be right there to push me up that hill. There's no, no looking back for us. No it ain't, baby. We got love. And sure enough, that's enough. GROSS: This is FRESH AIR. I'm Terry Gross. We're remembering Aretha Franklin. She died earlier today. I was lucky enough to interview her in 1999 after the publication of her memoir. Let's get back to that interview. GROSS: ...An arrangement by Bob Mercy. The song is "Skylark." Now, this is a period when you were recording with strings and voices behind you. Did you feel comfortable with this kind of setting? A. FRANKLIN: Oh, I love that. I loved it. Bob Mercy was in my opinion the best arranger - string arranger of the day. He did many - he did a few, not many, but he certainly did some of Streisand's things and other artists that were on Columbia at the time. But he was one of the absolute best. And then came Arif Mardin, who was at Atlantic Records after Bob Mercy. GROSS: OK, well, let's hear your version of "Skylark." A. FRANKLIN: (Singing) Skylark, have you anything to say to me? Won't you tell me where my love can be? Is there a meadow in the mist where someone's waiting to be kissed? Skylark, have you seen a valley green with spring where my heart can go a journeying over the shadows in the rain to a blossom-covered lane? And in your lonely flight, oh, haven't you heard music in the night - wonderful music faint as a will of the wisp, crazy as a loon, sad as a gypsy serenading the moon? Skylark, oh, I don't know if you can find these things. Oh, but my heart, my heart is riding on your wings. So if you see them anywhere, won't you lead me there? GROSS: That's Aretha Franklin from the early part of her pop recording career, Hoagy Carmichael's "Skylark." Now, you were playing a lot of clubs during those early years, and a lot of those clubs were jazz clubs. And the people who you shared a bill with included John Coltrane and Charles Mingus. Was this a new kind of music for you? A. FRANKLIN: Not exactly a new kind of music. As a very small girl, I listened to Charlie Parker and loved him and Max Roach and people like that. I had not been in the jazz environment having been brought up in the church. But once I got to New York and I was signed to perform at the Village Gate and the Vanguard and clubs like that and these - The Vanguard was one of the most elite if not the most elite jazz club out there - then I began to meet jazz musicians and to become more familiar with that environment and comfortable with it. GROSS: What was different about the jazz environment? What was - What were some of the things you hadn't been exposed to before? A. FRANKLIN: Well, I certainly had not been exposed to Charlie Mingus reaching over. And I think he slapped the pianist that - one night (laughter). A. FRANKLIN: Sitting in the audience then - this was at the Village Gate. And he kept right on playing. You know, nobody missed a beat. GROSS: We're listening to the interview I recorded in 1999 with Aretha Franklin. We'll hear more after a break. This is FRESH AIR. A. FRANKLIN: (Singing) Darling, you send me. Darling, you send me. Darling, you send me. Honest, you do. Honest, you do. Honest, you do. Oh, you thrill me. Darling, you thrill me. GROSS: This is FRESH AIR. Let's get back to the 1999 interview I recorded with Aretha Franklin. She died earlier today. GROSS: In 1966 after your contract with Columbia Records was up, you moved to Atlantic Records, which was the home of rhythm and blues greats like Ruth Brown and Ray Charles, LaVern Baker, the Drifters, the Clovers. How did you end up at Atlantic? A. FRANKLIN: We got a call - my former husband Ted White got a call from Jerry Wexler that they were interested in talking to and signing me at Atlantic Records. And we went over, and we sat, and we talked to Jerry. Jerry offered a delightful little bonus. A. FRANKLIN: And of course the rest is history. GROSS: Your sound really changed at Atlantic, and so did your material. Did he sit you down before you started recording and say, this is what I see for you; this is what I hear? A. FRANKLIN: Yes, he did. Actually, where I had been in the booth most of the time at Columbia and not at the piano, Jerry asked me to sit down and accompany myself. And that is where my career really took a drastic 160-degree turnaround. I just accompany myself in a very different way than most other pianists do. And I think that that was the factor that made the difference. GROSS: For your first Atlantic recording session, the producer, Jerry Wexler, took you down to a studio in Muscle Shoals, Ala., that was famous for its great session men which included Dan Penn and Spooner Oldham. And the first song that you recorded there was "I Never Loved A Man." Now, Spooner Oldham tells a story that when he heard you sit down at the piano and play your first chord, he thought, wow, that's really great and that he, who - and he's a pianist - that he shouldn't - he should let you play piano while he moved over to electric piano, playing behind you. What'd you think of that arrangement? Were you pleased that he agreed that you should be the one at the piano? A. FRANKLIN: I remember that particular session. It was the very first session. So naturally, yes, I remember it. And we really were kind of struggling at that point to get to the music. It just wasn't quite coming off although we had dynamite players. We had the Muscle Shoals section. And they were really very, very hot - cutting a lot of good, greasy stuff - or what you would call greasy in that day. But we weren't getting into the music in the way that we should have. It just wasn't coming off. And finally someone said, Aretha, why don't you sit down and play. And I did. And it just happened. It all just happened. We arrived, and we arrived very quickly. GROSS: Well, Peter Guralnick, the music critic, describes this recording "I Never Loved A Man" as one of the most momentous takes in the history of rhythm and blues - in fact, in the history of American vernacular music. Let's hear it. This is my guest Aretha Franklin. A. FRANKLIN: (Singing) You're a no good heartbreaker. You're a liar. And you're a cheat. And I don't know why I let you do these things to me. My friends keep telling me that you ain't no good. But, oh, they don't know that I'd leave you if I could. I guess I'm uptight. And I'm stuck like glue because I ain't never - I ain't never - I ain't never - no, no - loved a man the way that I love you. Some time ago, I thought you had run out of fools. But I was so wrong. You got one that you'll never lose. The way you treat me is a shame. How could you hurt me so bad? Baby, you know that I'm the best thing that you ever had. Kiss me once again. Don't you never, never say that we're through because I ain't never, never, never - no, no - loved a man that way that I love you. I can't sleep at night. And I can't even fight. I guess I'll never be free. GROSS: That's Aretha Franklin in her first recording for Atlantic Records. Now, your second single was "Respect," which is I believe your still most requested song. How did you end up singing this Otis Redding song? A. FRANKLIN: Well, I heard Mr. Redding's version of it. I just loved it. And I decided that I wanted to record it. And my sister Carolyn and I got together. And I was living in a small apartment on the west side of Detroit and - a piano by the window, watching the cars go by. And we came up with that infamous line - the sock it to me line. It was a cliche of the day. Actually, we didn't just come up with it. It really was cliche. And some of the girls were saying that to the fellows - like sock it to me in this way, or sock it to me in that way. And nothing sexual - and it's not sexual. It was non-sexual, just a cliche line. But anyway, laughing, picked it up, and it just kind of perpetuated itself and went on from there. GROSS: Well, let's hear Aretha Franklin singing "Respect." A. FRANKLIN: (Singing) What you want, baby, I got it. What you need, oh, you know I got it. All I'm asking is for a little respect when you get home, just a little bit. Hey, baby, just a little bit - when you get home. Just a little bit, mister - just a little bit. I ain't going to do you wrong while you're gone. I ain't going to do you wrong because I don't want to. All I'm asking is for a little respect when you come home, just a little bit. Baby, just a little bit - when you get home. Just a little bit - yeah, just a little bit. I'm about to give you all my money. And all I'm asking in return, honey, is to give me my propers when you get home. Just a, just a, just a, just a, just a, just a - just a little bit, just a little bit. Oh, your kisses, sweeter than honey. And guess what? So is my money. All I want you to do for me is give it to me when you get home, yeah, baby. re, re, re, re, re - whip it to me. Respect, just a little bit - just a little bit. R, E, S, P, E, C, T - find out what it means to me. R, E, S, P, E, C, T. Take care, TCB. Oh, sock it to me. Sock it to me. Sock it to me. Sock it to me - a little respect. Sock it to me. Sock it to me. Sock it to me. Sock it to me - just a little bit. Whoa, babe - just a little bit. A little respect - just a little bit. I get tired - just a little bit. Keep on trying - just a little bit. You're running out of fools - just a little bit. And I ain't lying - just a little bit. Re, re, re, re - when you come home. Re re, re – respect. Or you might walk in - respect, just a little bit. GROSS: What did this song mean to you when you sang it? I mean, really part of the backdrop of this song - it was a hit during the civil rights movement. And I think, you know, respect had a lot of meanings in this song for your listeners. One was, you know, just the respect you wanted from a man and a relationship. But it also had, I think, a larger resonance with the civil rights movement - you know, a kind of larger, social, cultural sense of respect. A. FRANKLIN: Yes. In later times, it was picked up as a battle cry by the civil rights movement. But when I recorded it, it was pretty much a male-female kind of thing and more in a general sense from person to person. I'm going to give you respect, and I'd like to have that respect back - or I expect respect to be given back. GROSS: Yeah. As we mentioned, the song, I think, resonated with the civil rights movement. Your family was good friends with Martin Luther King? How well did you know Dr. King? A. FRANKLIN: Dr. King was a family friend and a very good friend of my dad's. And occasionally, he would come to Detroit and spend time in our home or at our church - at my dad's church. I went out in the early days of the civil rights movement and did some performances for him, along with Esther Morrow and Harry Belafonte and different other vocalists - Bernard Lee, who was a foot soldier, Reverend Jackson, with Dr. King in those days. GROSS: We're listening to my 1999 interview with Aretha Franklin. We'll hear more after a break. This is FRESH AIR. A. FRANKLIN: (Singing) I said that I love it - R, E, S, P, E, C, T, yeah. Like the sweet morning dew, I took one look at you, and it was plain to see. You were my destiny. With my arms open wide, I threw away my pride. I'll sacrifice for you, dedicate my life for you. love. I will go where you lead. I'll be right there in a time of need. And when I lose my will, you'll be right there to push me up the hill. Let's go. There's no looking back for us. No, there ain't, baby. We got love sure enough. That's enough. You're all - you're all I need to get by. GROSS: This is FRESH AIR. We're devoting today's program to Aretha Franklin, who died earlier today. Let's get back to the interview I recorded with her in 1999. GROSS: Well, I want to play another song that I think, you know, had a lot of resonance - both in terms of personal relationships but had a larger resonance too because of the refrain freedom, freedom. And this is the song "Think," which you wrote. Tell us what you were thinking about when you wrote this song. A. FRANKLIN: The song "Think" really had to do with a personal relationship that I was involved in that really I didn't think was very good for me. And so "Think" became the result of that. GROSS: And this is your 1968 recording. A. FRANKLIN: (Singing) You better think - think about what you're trying to do to me. Think. Let your mind go. Let yourself be free. Let's go back. Let's go back. Let's go way on way back when. I didn't even know you. You couldn't have been too much more than ten. I ain't no psychiatrist. I ain't no doctor with degrees. But it don't take too much high IQs to see what you're doing to me. You better think - think about what you're trying to do to me. Yeah, think. Let your mind go. Let yourself be free. Oh, freedom. Get yourself some freedom. Oh, freedom. Yeah, freedom. Freedom. Oh, freedom. Yeah, freedom. Hey, think about it. Think about it. GROSS: That's Aretha Franklin recorded in 1968. Now, is that the Sweet Inspirations behind you were on that track? A. FRANKLIN: Yes, it is. GROSS: Now, you know that it was the ambition of many young women to someday be a Sweet Inspiration. And, of course, they knew they wouldn't be, so they just kind of did the backup vocals in their living rooms. So what's it like for you as a singer to have really good backup vocalists behind you? Is that a real boost? A. FRANKLIN: Well, it's certainly meaningful, yes. There's a lot of interplay between the lead singer and the background. And, of course, they are very, very supportive to the lead. And it's great. You can create with them and just come up with whatever your objectives - your musical objectives are. GROSS: When you were at Columbia Records, you had some success and performed at a lot of clubs, but you didn't have hit records. When you were at Atlantic, you had hit after hit after hit and became, you know, the queen of soul. And I'm wondering if there were things about success that surprised you or that you were really unprepared for. A. FRANKLIN: Mainly, I think the thing that I was most unprepared for was the traveling. I went out on a couple of tours, and those tours were my first and very last tours. I went out on a tour with Sam for about a month, and I never should have done that - just far too many days, two much getting on and off airplanes every day and in and out of hotels. And it just was not something that I was accustomed to or ready for. And of course I did one with Jackie Wilson sometime after then, but I never did another tour of that - to that extent or that degree after that. GROSS: What was your father, Reverend Franklin's, reaction to your being the queen of soul? A. FRANKLIN: He loved it (laughter). He loved it. My dad was my greatest fan I think with - along with my brother Cecil, who was my former manager as well. GROSS: What do you most like to sing now? A. FRANKLIN: I love to sing everything. Right now, I am working on two arias that I am preparing for my performance with the Detroit Symphony Orchestra. I am doing "Doretta's Aria," and I'm also doing "Ombra Mai Fu." GROSS: Did you ever listen to opera when you were young, or is this a new interest of yours? A. FRANKLIN: Yes, I did. No, no, I heard opera as a very, very young child. Mario Lanza used to play in our home. I don't know how it got there, but it was there. There was a passage in the book where Smokey's niece Sylvia and Erma are lying under the big radio - this 19 - what? - '30s, '40s radio. And Mario Lanza is playing, and Sylvia is lying there with her ear pressed to the speaker, crying. And I'm observing all of this, watching Erma and Sylvia. And I think it is a riot. It's the funniest thing I've ever seen. Why is she crying? I could just never figure that out as a little girl. Of course as I became older and a teenager, certainly I realized her sensitivity to the music and that sort of thing and the way that she was relating. But I thought it was the funniest thing as a child. GROSS: Aretha Franklin, thank you so much for talking with us. A. FRANKLIN: Thank you. It's been my pleasure. And thank you so much for having me. 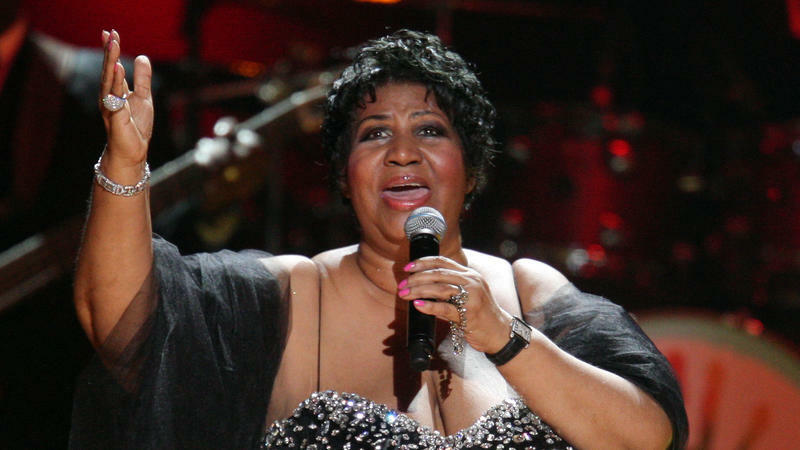 GROSS: Aretha Franklin recorded in 1999 - she died earlier today at the age of 76. Like everyone else who ever heard her sing, I am so grateful for the music she gave us, the records so many of us know by heart. Rest in peace. If you'd like to catch up on FRESH AIR interviews you missed like this week's interview with Karen Piper whose memoir is about growing up in the '70s on a secretive Navy missile development and test site in the Mojave Desert where her parents helped design missiles, check out our podcast. You'll find lots of FRESH AIR interviews. FRESH AIR's executive producer is Danny Miller. Our interviews and reviews are produced and edited by Amy Salit, Phyllis Myers, Sam Briger, Lauren Krenzel, Heidi Saman, Therese Madden, Mooj Zadie and Seth Kelley. Thea Chaloner directed today's show. I'm Terry Gross. A. FRANKLIN: (Singing) Looking out on the morning rain, I used to feel so uninspired. And when I knew I had to face another day, Lord, it made me feel so tired. Before the day I met you, life was so unkind. You're the key to my peace of mind 'cause you make me feel, you make me feel, you make me feel like a natural woman, woman. (Singing) When my soul was in the lost and found, you came along to claim it. I didn't know just what was wrong with me until your kiss helped me name it. Now, I'm no longer doubtful of what I'm living for. And if I make you happy, I don't need to do more 'cause you make me feel, you make me feel, you make me feel like a natural woman, woman. [POST-BROADCAST CORRECTION: A previous version of this transcript incorrectly identified singer Arthur Prysock as Arthur Price.] Transcript provided by NPR, Copyright NPR.